Los Angeles, CA (February 10, 2015) — Alchemy is proud to announce the home entertainment release of the dramedy, The Humbling . Directed by Academy Award® award Barry Levinson (Rain Man), the film features Academy Award® winner Al Pacino (The Godfather trilogy, Dog Day Afternoon, Scent of a Woman), Golden Globe® nominee Greta Gerwig (Frances Ha, Greenberg), Tony Award® winner Nina Arianda (Venus in Fur) Academy Award® winner Dianne Wiest (Bullets Over Broadway, Hannah and Her Sisters) Golden Globe® nominee Charles Grodin (Midnight Run, FX's Louie), Dan Hedaya and Golden Globe® winner Kyra Sedgwick (TNT's The Closer). The Humbling will be available on DVD and Blu-ray™ on March 3rd, 2015. 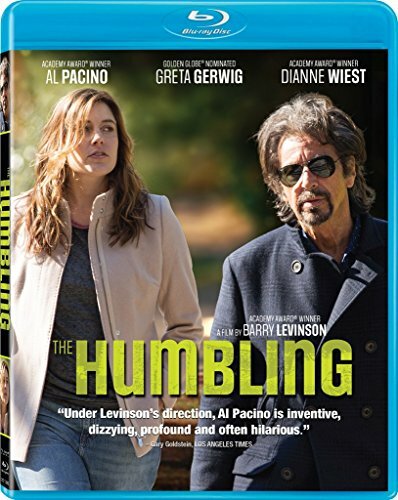 Based on Phillip Roth's final novel, The Humbling tells the story of over-the-hill stage actor Simon Axler (Al Pacino) and his struggles to find his passion for life again. Near his breaking point, he finds motivation in the form of a young and lustful lesbian Pegeen Stapleford (Greta Gerwig), but as their relationship heats up Simon has a hard time keeping up with the youthful Pegeen.